This morning I met with Debbie Smyth at Manchester Craft and Design Centre. Having just arrived in Manchester for the week Debbie is busy installing her first solo show at the Centre following selection as best in show at the Great Northern Contemporary Craft Fair last year. Her work beautifully blurs the boundaries between 2d and 3d artistry, literally lifting the drawn line off the page in a series of "pin and thread" drawings. Beginning with hand sketched illustrations she projects her drawings onto the gallery walls in order to create a framework of anchor points that are then connected with varying thicknesses of black thread. Rather than simply tracing outlines, however, Smyth deftly manages to incorporate the animated nature of her creative practice into the works she produces, almost leaving traces of her mental processes in capturing a subject. Sometimes extending the wandering lines between pieces, Smyth creates interruptions within the gallery space connecting her works, in doing so she manages to gently guide the viewer through the gallery giving a sense of theatre and presence that can't be captured by images alone. Energetic, intriguing, original and playful Smyth's work is a refreshing approach to illustration that displays texture and scale that need to be seen in the flesh to be truly appreciated. You can even talk to her while she installs the new commission, inspired by the characters and architecture that populate the Northern Quarter around the venue, all this week. 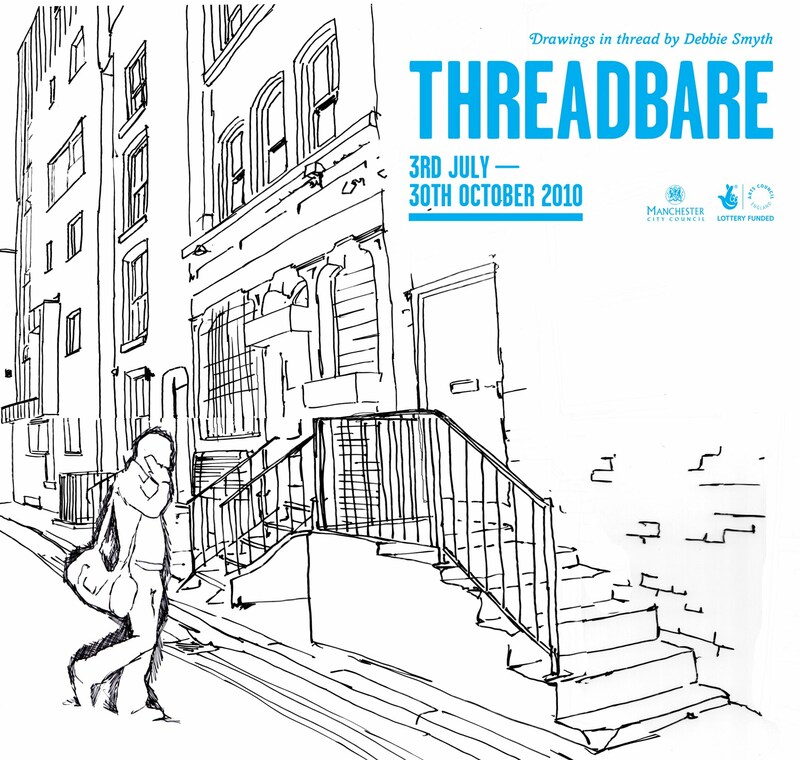 But if you can't make it down you can listen to her talking to me about pin and thread drawing, the tensions between craft and art, studying in Wales, and tips on artistic success here.